Standard frequency crystal at 20.000Mhz, use this crystal to provide a clock input to your microprocessor. 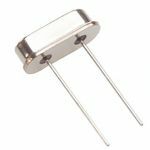 Standard frequency crystal at 16.000Mhz, use this crystal to provide a clock input to your microprocessor. Standard frequency crystal at 12.000Mhz, use this crystal to provide a clock input to your microprocessor. Standard frequency crystal at 8.000Mhz, use this crystal to provide a clock input to your microprocessor. Standard frequency crystal at 4.000Mhz, use this crystal to provide a clock input to your microprocessor. Mix of standard crystals with frequencies from 4.000Mhz to 20.000 Mhz, there are 25 pcs. in total.